She looks so cute with her paw in the bowl. 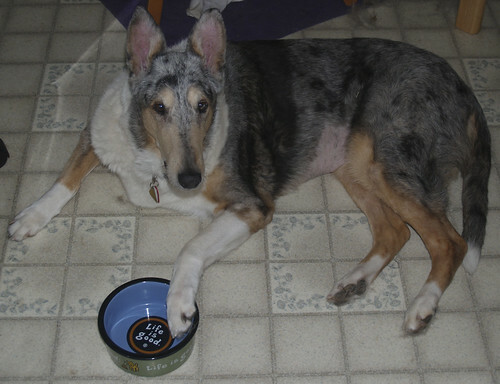 Reminds me a bit of Marley…..She lays there by her bowl when she finishes. I think she hopes I will put more food in it. Christys last blog post..Time for a biopsy…. LOL Christy, Lucy always wants more food in there too! That is an advanced dog maneuver, proving that your Lucy is, indeed, a very smart girl. Hi HaleyHuges! 🙂 It’s funny that my other dogs have not figured it out. I can tell just by looking at Lucy that she is very smart! Awww, what a sweetheart. We have two cats (brother and sister) but I miss our dog. Such a pretty face, looking at you very trusting and devoted… I’m sure she is a loyal friend! Ohhh Lucy, what a beautiful baby you are!! And oh so smart! Aw, what a cutie. I’m glad she still loves to eat! She looks like a happy girl. I love her expression. Dogs are so darn smart, aren’t they? Awe bless! she looks so happy and sweet in that picture! Iâ€™m glad she still loves to eat! She looks like a happy girl. I love her expression.